Between 1940 and 1996, the U.S. government spent at least $9.3 trillion in present-day terms on nuclear weapons, including platforms development (aircraft, rockets and facilities), command and control, maintenance, waste management and administrative costs. It is estimated that, since 1945, the United States produced more than 70,000 nuclear warheads, which is more than all other nuclear weapon states combined. The Soviet Union/Russia has produced approximately 55,000 nuclear warheads since 1949, France built 1,110 warheads since 1960, the United Kingdom built 835 warheads since 1952, China built about 600 warheads since 1964, and other nuclear powers built fewer than 500 warheads all together since they developed their first nuclear weapons. Until November 1962, the vast majority of U.S. nuclear tests were above ground. After the acceptance of the Partial Nuclear Test Ban Treaty, all testing was relegated underground, in order to prevent the dispersion of nuclear fallout. By February 2006 over $1.2 billion in compensation had been paid to U.S. citizens exposed to nuclear hazards as a result of the U.S. nuclear weapons program, and by 1998 at least $759 million had been paid to the Marshall Islanders in compensation for their exposure to U.S. nuclear testing. The U.S. and Russia possess comparable numbers of nuclear warheads; together, these two nations possess more than 90% of the world's nuclear warheads. As of 2017, the U.S. has an inventory of 6,800 nuclear warheads; of these, 2,800 are retired and awaiting dismantlement and 4,018 are part of the U.S. stockpile. Of the stockpiled warheads, the U.S. stated in its April 2017 New START declaration that 1,411 are deployed on 673 ICBMs, SLBMs, and strategic bombers. ✪ How Would We Stop a Nuclear Missile? The Trinity test of the Manhattan Project was the first detonation of a nuclear weapon. The United States first began developing nuclear weapons during World War II under the order of President Franklin Roosevelt in 1939, motivated by the fear that they were engaged in a race with Nazi Germany to develop such a weapon. After a slow start under the direction of the National Bureau of Standards, at the urging of British scientists and American administrators, the program was put under the Office of Scientific Research and Development, and in 1942 it was officially transferred under the auspices of the United States Army and became known as the Manhattan Project, an American, British and Canadian joint venture. Under the direction of General Leslie Groves, over thirty different sites were constructed for the research, production, and testing of components related to bomb-making. These included the Los Alamos National Laboratory at Los Alamos, New Mexico, under the direction of physicist Robert Oppenheimer, the Hanford plutonium production facility in Washington, and the Y-12 National Security Complex in Tennessee. By investing heavily in breeding plutonium in early nuclear reactors and in the electromagnetic and gaseous diffusion enrichment processes for the production of uranium-235, the United States was able to develop three usable weapons by mid-1945. The Trinity test was a plutonium implosion-design weapon tested on 16 July 1945, with around a 20 kiloton yield. Faced with a planned invasion of the Japanese home islands scheduled to begin on 1 November 1945 and with Japan not surrendering, President Harry S. Truman ordered the atomic raids on Japan. On 6 August 1945, the U.S. detonated a uranium-gun design bomb, Little Boy, over the Japanese city of Hiroshima with an energy of about 15 kilotons of TNT, killing approximately 70,000 people, among them 20,000 Japanese combatants and 20,000 Korean slave laborers, and destroying nearly 50,000 buildings (including the 2nd General Army and Fifth Division headquarters). Three days later, on 9 August, the U.S. attacked Nagasaki using a plutonium implosion-design bomb, Fat Man, with the explosion equivalent to about 20 kilotons of TNT, destroying 60% of the city and killing approximately 35,000 people, among them 23,200–28,200 Japanese munitions workers, 2,000 Korean slave laborers, and 150 Japanese combatants. On January 1, 1947, the Atomic Energy Act of 1946 (known as the McMahon Act) took effect, and the Manhattan Project was officially turned over to the United States Atomic Energy Commission. On August 15, 1947, the Manhattan District was abolished. Between 1945 and 1990, more than 70,000 total warheads were developed, in over 65 different varieties, ranging in yield from around .01 kilotons (such as the man-portable Davy Crockett shell) to the 25 megaton B41 bomb. Between 1940 and 1996, the U.S. spent at least $9.3 trillion in present-day terms on nuclear weapons development. Over half was spent on building delivery mechanisms for the weapon. $583 billion in present-day terms was spent on nuclear waste management and environmental remediation. Richland, Washington was the first city established to support plutonium production at the nearby Hanford nuclear site, to power the American nuclear weapons arsenals. It produced plutonium for use in cold war atomic bombs. Throughout the Cold War, the U.S. and USSR threatened with all-out nuclear attack in case of war, regardless of whether it was a conventional or a nuclear clash. U.S. nuclear doctrine called for mutually assured destruction (MAD), which entailed a massive nuclear attack against strategic targets and major populations centers of the Soviet Union and its allies. The term "mutual assured destruction" was coined in 1962 by American strategist Donald Brennan. MAD was implemented by deploying nuclear weapons simultaneously on three different types of weapons platforms. After the end of the Cold War following the dissolution of the Soviet Union in 1991, the U.S. nuclear program was heavily curtailed, halting its program of nuclear testing, ceasing production of new nuclear weapons, and reducing its stockpile by half by the mid-1990s under President Bill Clinton. Many of its former nuclear facilities were shut down, and their sites became targets of extensive environmental remediation. Much of the former efforts towards the production of weapons became involved in the program of stockpile stewardship, attempting to predict the behavior of aging weapons without using full-scale nuclear testing. Increased funding was also put into anti-nuclear proliferation programs, such as helping the states of the former Soviet Union eliminate their former nuclear sites, and assist Russia in their efforts to inventory and secure their inherited nuclear stockpile. By February 2006, over $1.2 billion had been paid under the Radiation Exposure Compensation Act of 1990 to U.S. citizens exposed to nuclear hazards as a result of the U.S. nuclear weapons program, and by 1998 at least $759 million had been paid to the Marshall Islanders in compensation for their exposure to U.S. nuclear testing, and over $15 million was paid to the Japanese government following the exposure of its citizens and food supply to nuclear fallout from the 1954 "Bravo" test. In 1998, the country spent an estimated total of $35.1 billion on its nuclear weapons and weapons-related programs. In the 2013 book Plutopia: Nuclear Families, Atomic Cities, and the Great Soviet and American Plutonium Disasters (Oxford), Kate Brown explores the health of affected citizens in the United States, and the "slow-motion disasters" that still threaten the environments where the plants are located. According to Brown, the plants at Hanford, over a period of four decades, released millions of curies of radioactive isotopes into the surrounding environment. Brown says that most of this radioactive contamination over the years at Hanford were part of normal operations, but unforeseen accidents did occur and plant management kept this secret, as the pollution continued unabated. Even today, as pollution threats to health and the environment persist, the government keeps knowledge about the associated risks from the public. During the presidency of George W. Bush, and especially after the 11 September terrorist attacks of 2001, rumors have circulated in major news sources that the U.S. has been considering design of new nuclear weapons ("bunker-busting nukes"), and the resumption of nuclear testing for reasons of stockpile stewardship. Statements by the U.S. government in 2004, however, indicated that the arsenal will drop to around 5,500 total warheads by 2012. According to recent reports, much of that reduction was already accomplished by January 2008. The U.S. conducted hundreds of nuclear tests at the Nevada Test Site. Members of Nevada Desert Experience hold a prayer vigil during the Easter period of 1982 at the entrance to the Nevada Test Site. Shot "Baker" of Operation Crossroads (1946) was the first underwater nuclear explosion. Between 16 July 1945 and 23 September 1992, the United States maintained a program of vigorous nuclear testing, with the exception of a moratorium between November 1958 and September 1961. By official count, a total of 1,054 nuclear tests and two nuclear attacks were conducted, with over 100 of them taking place at sites in the Pacific Ocean, over 900 of them at the Nevada Test Site, and ten on miscellaneous sites in the United States (Alaska, Colorado, Mississippi, and New Mexico). Until November 1962, the vast majority of the U.S. tests were atmospheric (that is, above-ground); after the acceptance of the Partial Test Ban Treaty all testing was relegated underground, in order to prevent the dispersion of nuclear fallout. The U.S. program of atmospheric nuclear testing exposed a number of the population to the hazards of fallout. Estimating exact numbers, and the exact consequences, of people exposed has been medically very difficult, with the exception of the high exposures of Marshall Islanders and Japanese fishers in the case of the Castle Bravo incident in 1954. A number of groups of U.S. citizens—especially farmers and inhabitants of cities downwind of the Nevada Test Site and U.S. military workers at various tests—have sued for compensation and recognition of their exposure, many successfully. The passage of the Radiation Exposure Compensation Act of 1990 allowed for a systematic filing of compensation claims in relation to testing as well as those employed at nuclear weapons facilities. By June 2009 over $1.4 billion total has been given in compensation, with over $660 million going to "downwinders". Trinity test on 16 July 1945, was the world's first test of a nuclear weapon (yield of around 20 kt). Operation Crossroads series in July 1946, was the first postwar test series and one of the largest military operations in U.S. history. Operation Greenhouse shots of May 1951 included the first boosted fission weapon test ("Item") and a scientific test that proved the feasibility of thermonuclear weapons ("George"). Ivy Mike shot of 1 November 1952, was the first full test of a Teller-Ulam design "staged" hydrogen bomb, with a yield of 10 megatons. It was not a deployable weapon, however—with its full cryogenic equipment it weighed some 82 tons. Castle Bravo shot of 1 March 1954, was the first test of a deployable (solid fuel) thermonuclear weapon, and also (accidentally) the largest weapon ever tested by the United States (15 megatons). It was also the single largest U.S. radiological accident in connection with nuclear testing. The unanticipated yield, and a change in the weather, resulted in nuclear fallout spreading eastward onto the inhabited Rongelap and Rongerik atolls, which were soon evacuated. Many of the Marshall Islanders have since suffered from birth defects and have received some compensation from the federal government. A Japanese fishing boat, Daigo Fukuryū Maru, also came into contact with the fallout, which caused many of the crew to grow ill; one eventually died. Shot Argus I of Operation Argus, on 27 August 1958, was the first detonation of a nuclear weapon in outer space when a 1.7-kiloton warhead was detonated at an altitude of 200 kilometres (120 mi) during a series of high altitude nuclear explosions. Shot Frigate Bird of Operation Dominic I on 6 May 1962, was the only U.S. test of an operational submarine-launched ballistic missile (SLBM) with a live nuclear warhead (yield of 600 kilotons), at Christmas Island. In general, missile systems were tested without live warheads and warheads were tested separately for safety concerns. In the early 1960s, however, there mounted technical questions about how the systems would behave under combat conditions (when they were "mated", in military parlance), and this test was meant to dispel these concerns. However, the warhead had to be somewhat modified before its use, and the missile was a SLBM (and not an ICBM), so by itself it did not satisfy all concerns. Shot Sedan of Operation Storax on 6 July 1962 (yield of 104 kilotons), was an attempt to show the feasibility of using nuclear weapons for "civilian" and "peaceful" purposes as part of Operation Plowshare. In this instance, a 1,280-foot (390 m) diameter 320-foot (98 m) deep crater was created at the Nevada Test Site. A summary table of each of the American operational series may be found at United States' nuclear test series. Early weapons models, such as the "Fat Man" bomb, were extremely large and difficult to use. The original Little Boy and Fat Man weapons, developed by the United States during the Manhattan Project, were relatively large (Fat Man had a diameter of 5 feet (1.5 m)) and heavy (around 5 tons each) and required specially modified bomber planes to be adapted for their bombing missions against Japan. Each modified bomber could only carry one such weapon and only within a limited range. After these initial weapons were developed, a considerable amount of money and research was conducted towards the goal of standardizing nuclear warheads so that they did not require highly specialized experts to assemble them before use, as in the case with the idiosyncratic wartime devices, and miniaturization of the warheads for use in more variable delivery systems. Through the aid of brainpower acquired through Operation Paperclip at the tail end of the European theater of World War II, the United States was able to embark on an ambitious program in rocketry. One of the first products of this was the development of rockets capable of holding nuclear warheads. The MGR-1 Honest John was the first such weapon, developed in 1953 as a surface-to-surface missile with a 15-mile (24 km) maximum range. Because of their limited range, their potential use was heavily constrained (they could not, for example, threaten Moscow with an immediate strike). The MGR-1 Honest John was the first nuclear-tipped rocket developed by the U.S.
Development of long-range bombers, such as the B-29 Superfortress during World War II, was continued during the Cold War period. In 1946, the Convair B-36 Peacemaker became the first purpose-built nuclear bomber; it served with the USAF until 1959. The Boeing B-52 Stratofortress was able by the mid-1950s to carry a wide arsenal of nuclear bombs, each with different capabilities and potential use situations. Starting in 1946, the U.S. based its initial deterrence force on the Strategic Air Command, which, by the late 1950s, maintained a number of nuclear-armed bombers in the sky at all times, prepared to receive orders to attack the USSR whenever needed. This system was, however, tremendously expensive, both in terms of natural and human resources, and raised the possibility of an accidental nuclear war. During the 1950s and 1960s, elaborate computerized early warning systems such as Defense Support Program were developed to detect incoming Soviet attacks and to coordinate response strategies. During this same period, intercontinental ballistic missile (ICBM) systems were developed that could deliver a nuclear payload across vast distances, allowing the U.S. to house nuclear forces capable of hitting the Soviet Union in the American Midwest. Shorter-range weapons, including small tactical weapons, were fielded in Europe as well, including nuclear artillery and man-portable Special Atomic Demolition Munition. The development of submarine-launched ballistic missile systems allowed for hidden nuclear submarines to covertly launch missiles at distant targets as well, making it virtually impossible for the Soviet Union to successfully launch a first strike attack against the United States without receiving a deadly response. Improvements in warhead miniaturization in the 1970s and 1980s allowed for the development of MIRVs—missiles which could carry multiple warheads, each of which could be separately targeted. The question of whether these missiles should be based on constantly rotating train tracks (to avoid being easily targeted by opposing Soviet missiles) or based in heavily fortified silos (to possibly withstand a Soviet attack) was a major political controversy in the 1980s (eventually the silo deployment method was chosen). MIRVed systems enabled the U.S. to render Soviet missile defenses economically unfeasible, as each offensive missile would require between three and ten defensive missiles to counter. Additional developments in weapons delivery included cruise missile systems, which allowed a plane to fire a long-distance, low-flying nuclear-tipped missile towards a target from a relatively comfortable distance. The current delivery systems of the U.S. make virtually any part of the Earth's surface within the reach of its nuclear arsenal. Though its land-based missile systems have a maximum range of 10,000 kilometres (6,200 mi) (less than worldwide), its submarine-based forces extend its reach from a coastline 12,000 kilometres (7,500 mi) inland. Additionally, in-flight refueling of long-range bombers and the use of aircraft carriers extends the possible range virtually indefinitely. Command and control procedures in case of nuclear war were given by the Single Integrated Operational Plan (SIOP) until 2003, when this was superseded by Operations Plan 8044. Since World War II, the President of the United States has had sole authority to launch U.S. nuclear weapons, whether as a first strike or nuclear retaliation. This arrangement was seen as necessary during the Cold War to present a credible nuclear deterrent; if an attack was detected, the United States would have only minutes to launch a counterstrike before its nuclear capability was severely damaged, or national leaders killed. If the President has been killed, command authority follows the presidential line of succession. Changes to this policy have been proposed, but currently the only way to countermand such an order before the strike was launched would be for the Vice President and the majority of the Cabinet to relieve the President under Section 4 of the Twenty-fifth Amendment to the United States Constitution. When President Reagan was shot in 1981 there was confusion about where the "nuclear football" was, and who was in charge. Starting with President Eisenhower, authority to launch a full scale nuclear attack has been delegated to theater commanders and other specific commanders if they believed it was warranted by circumstances, and were out of communication with the president or the president had been incapacitated. For example, during the Cuban Missile Crisis, on October 24, 1962, General Thomas Power, commander of the Strategic Air Command (SAC), took the country to DEFCON 2, the very precipice of full-scale nuclear war, launching the SAC bombers of the US with nuclear weapons ready to strike. Moreover, some of these commanders subdelegated to lower commanders the authority to launch nuclear weapons under similar circumstance. In fact, the nuclear weapons were not placed under locks until decades later, so pilots or individual submarine commanders had the power, but not the authority, to launch nuclear weapons entirely on their own. The Castle Bravo fallout plume spread dangerous levels of radioactive material over an area over 100 miles (160 km) long, including inhabited islands, in the largest single U.S. nuclear accident. The United States nuclear program since its inception has experienced accidents of varying forms, ranging from single-casualty research experiments (such as that of Louis Slotin during the Manhattan Project), to the nuclear fallout dispersion of the Castle Bravo shot in 1954, to the accidental dropping of nuclear weapons from aircraft (broken arrows). How close any of these accidents came to being major nuclear disasters is a matter of technical and scholarly debate and interpretation. Weapons accidentally dropped by the United States include incidents near Atlantic City, New Jersey (1957), Savannah, Georgia (1958) (see Tybee Bomb), Goldsboro, North Carolina (1961) (see 1961 Goldsboro B-52 crash), off the coast of Okinawa (1965), in the sea near Palomares, Spain (1966, see 1966 Palomares B-52 crash), and near Thule Air Base, Greenland (1968) (see 1968 Thule Air Base B-52 crash). In some of these cases (such as Palomares), the explosive system of the fission weapon discharged, but did not trigger a nuclear chain reaction (safety features prevent this from easily happening), but did disperse hazardous nuclear materials across wide areas, necessitating expensive cleanup endeavors. Eleven American nuclear warheads are thought to be lost and unrecovered, primarily in submarine accidents. The nuclear testing program resulted in a number of cases of fallout dispersion onto populated areas. The most significant of these was the Castle Bravo test, which spread radioactive ash over an area of over 100 square miles (260 km2), including a number of populated islands. The populations of the islands were evacuated but not before suffering radiation burns. They would later suffer long-term effects, such as birth defects and increased cancer risk. There were also instances during the nuclear testing program in which soldiers were exposed to overly high levels of radiation, which grew into a major scandal in the 1970s and 1980s, as many soldiers later suffered from what were claimed to be diseases caused by their exposures. Many of the former nuclear facilities (see next section) produced significant environmental damages during their years of activity, and since the 1990s have been Superfund sites of cleanup and environmental remediation. The Radiation Exposure Compensation Act of 1990 allows for U.S. citizens exposed to radiation or other health risks through the U.S. nuclear program to file for compensation and damages. In 1972 three hijackers took control of a domestic passenger flight along the east coast of the U.S. and threatened to crash the plane into a U.S. nuclear weapons plant in Oak Ridge, Tennessee. The plane got as close as 8,000 feet above the site before the hijackers' demands were met. Various acts of civil disobedience since 1980 by the peace group Plowshares have shown how nuclear weapons facilities can be penetrated, and the group's actions represent extraordinary breaches of security at nuclear weapons plants in the United States. The National Nuclear Security Administration has acknowledged the seriousness of the 2012 Plowshares action. Non-proliferation policy experts have questioned "the use of private contractors to provide security at facilities that manufacture and store the government's most dangerous military material". Nuclear weapons materials on the black market are a global concern, and there is concern about the possible detonation of a small, crude nuclear weapon by a militant group in a major city, with significant loss of life and property. Stuxnet is a computer worm discovered in June 2010 that is believed to have been created by the United States and Israel to attack Iran's nuclear facilities. The United States Atomic Energy Commission (1946–1974) managed the U.S. nuclear program after the Manhattan Project. The initial U.S. nuclear program was run by the National Bureau of Standards starting in 1939 under the edict of President Franklin Delano Roosevelt. Its primary purpose was to delegate research and dispense funds. In 1940 the National Defense Research Committee (NDRC) was established, coordinating work under the Committee on Uranium among its other wartime efforts. In June 1941, the Office of Scientific Research and Development (OSRD) was established, with the NDRC as one of its subordinate agencies, which enlarged and renamed the Uranium Committee as the Section on Uranium. In 1941, NDRC research was placed under direct control of Vannevar Bush as the OSRD S-1 Section, which attempted to increase the pace of weapons research. In June 1942, the U.S. Army Corps of Engineers took over the project to develop atomic weapons, while the OSRD retained responsibility for scientific research. This was the beginning of the Manhattan Project, run as the Manhattan Engineering District (MED), an agency under military control that was in charge of developing the first atomic weapons. After World War II, the MED maintained control over the U.S. arsenal and production facilities and coordinated the Operation Crossroads tests. In 1946 after a long and protracted debate, the Atomic Energy Act of 1946 was passed, creating the Atomic Energy Commission (AEC) as a civilian agency that would be in charge of the production of nuclear weapons and research facilities, funded through Congress, with oversight provided by the Joint Committee on Atomic Energy. The AEC was given vast powers of control over secrecy, research, and money, and could seize lands with suspected uranium deposits. Along with its duties towards the production and regulation of nuclear weapons, it was also in charge of stimulating development and regulating civilian nuclear power. The full transference of activities was finalized in January 1947. In 1975, following the "energy crisis" of the early 1970s and public and congressional discontent with the AEC (in part because of the impossibility to be both a producer and a regulator), it was disassembled into component parts as the Energy Research and Development Administration (ERDA), which assumed most of the AEC's former production, coordination, and research roles, and the Nuclear Regulatory Commission, which assumed its civilian regulation activities. ERDA was short-lived, however, and in 1977 the U.S. nuclear weapons activities were reorganized under the Department of Energy, which maintains such responsibilities through the semi-autonomous National Nuclear Security Administration. Some functions were taken over or shared by the Department of Homeland Security in 2002. The already-built weapons themselves are in the control of the Strategic Command, which is part of the Department of Defense. In general, these agencies served to coordinate research and build sites. They generally operated their sites through contractors, however, both private and public (for example, Union Carbide, a private company, ran Oak Ridge National Laboratory for many decades; the University of California, a public educational institution, has run the Los Alamos and Lawrence Livermore laboratories since their inception, and will jointly manage Los Alamos with the private company Bechtel as of its next contract). Funding was received both through these agencies directly, but also from additional outside agencies, such as the Department of Defense. Each branch of the military also maintained its own nuclear-related research agencies (generally related to delivery systems). This table is not comprehensive, as numerous facilities throughout the United States have contributed to its nuclear weapons program. It includes the major sites related to the U.S. weapons program (past and present), their basic site functions, and their current status of activity. Not listed are the many bases and facilities at which nuclear weapons have been deployed. 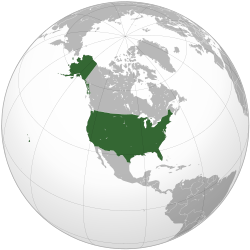 In addition to deploying weapons on its own soil, during the Cold War, the United States also stationed nuclear weapons in 27 foreign countries and territories, including Okinawa (which was US-controlled until 1971,) Japan (during the occupation immediately following World War II), Greenland, Germany, Taiwan, and French Morocco then independent Morocco. 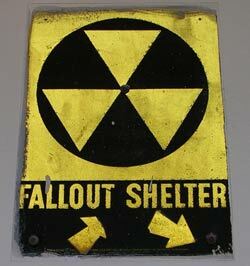 A sign pointing to an old fallout shelter in New York City. The Atoms for Peace program distributed nuclear technology, materials, and know-how to many less technologically advanced countries. Early on in the development of its nuclear weapons, the United States relied in part on information-sharing with both the United Kingdom and Canada, as codified in the Quebec Agreement of 1943. These three parties agreed not to share nuclear weapons information with other countries without the consent of the others, an early attempt at nonproliferation. After the development of the first nuclear weapons during World War II, though, there was much debate within the political circles and public sphere of the United States about whether or not the country should attempt to maintain a monopoly on nuclear technology, or whether it should undertake a program of information sharing with other nations (especially its former ally and likely competitor, the Soviet Union), or submit control of its weapons to some sort of international organization (such as the United Nations) who would use them to attempt to maintain world peace. Though fear of a nuclear arms race spurred many politicians and scientists to advocate some degree of international control or sharing of nuclear weapons and information, many politicians and members of the military believed that it was better in the short term to maintain high standards of nuclear secrecy and to forestall a Soviet bomb as long as possible (and they did not believe the USSR would actually submit to international controls in good faith). Since this path was chosen, the United States was, in its early days, essentially an advocate for the prevention of nuclear proliferation, though primarily for the reason of self-preservation. A few years after the USSR detonated its first weapon in 1949, though, the U.S. under President Dwight D. Eisenhower sought to encourage a program of sharing nuclear information related to civilian nuclear power and nuclear physics in general. The Atoms for Peace program, begun in 1953, was also in part political: the U.S. was better poised to commit various scarce resources, such as enriched uranium, towards this peaceful effort, and to request a similar contribution from the Soviet Union, who had far fewer resources along these lines; thus the program had a strategic justification as well, as was later revealed by internal memos. This overall goal of promoting civilian use of nuclear energy in other countries, while also preventing weapons dissemination, has been labeled by many critics as contradictory and having led to lax standards for a number of decades which allowed a number of other nations, such as China and India, to profit from dual-use technology (purchased from nations other than the U.S.). The Cooperative Threat Reduction program of the Defense Threat Reduction Agency was established after the breakup of the Soviet Union in 1991 to aid former Soviet bloc countries in the inventory and destruction of their sites for developing nuclear, chemical, and biological weapons, and their methods of delivering them (ICBM silos, long-range bombers, etc.). Over $4.4 billion has been spent on this endeavor to prevent purposeful or accidental proliferation of weapons from the former Soviet arsenal. After India and Pakistan tested nuclear weapons in 1998, President Bill Clinton imposed economic sanctions on the countries. In 1999, however, the sanctions against India were lifted; those against Pakistan were kept in place as a result of the military government that had taken over. Shortly after the September 11 attacks in 2001, President George W. Bush lifted the sanctions against Pakistan as well, in order to get the Pakistani government's help as a conduit for US and NATO forces for operations in Afghanistan. The U.S. government has officially taken a silent policy towards the nuclear weapons ambitions of the state of Israel, while being exceedingly vocal against proliferation of such weapons in the countries of Iran and North Korea. Until 2005 when the program was cancelled, it was violating its own non-proliferation treaties in the pursuit of so-called nuclear bunker busters. The 2003 invasion of Iraq by the U.S. was done, in part, on indications that Weapons of mass destruction were being stockpiled (later, stockpiles of previously undeclared nerve agent and mustard gas shells were located in Iraq), and the Bush administration said that its policies on proliferation were responsible for the Libyan government's agreement to abandon its nuclear ambitions. The United States is one of the five nuclear weapons states with a declared nuclear arsenal under the Treaty on the Non-Proliferation of Nuclear Weapons (NPT), of which it was an original drafter and signatory on 1 July 1968 (ratified 5 March 1970). All signatories of the NPT agreed to refrain from aiding in nuclear weapons proliferation to other states. The International Atomic Energy Agency (IAEA) in 2005 proposed a comprehensive ban on fissile material that would greatly limit the production of weapons of mass destruction. One hundred forty seven countries voted for this proposal but the United States voted against. The US government has also resisted the Treaty on the Prohibition of Nuclear Weapons, a binding agreement for negotiations for the total elimination of nuclear weapons, supported by more than 120 nations. In 1958, the United States Air Force had considered a plan to drop nuclear bombs on China during a confrontation over Taiwan but it was overruled, previously secret documents showed after they were declassified due to the Freedom of Information Act in April 2008. The plan included an initial plan to drop 10–15 kiloton bombs on airfields in Amoy (now called Xiamen) in the event of a Chinese blockade against Taiwan's Offshore Islands. The Energy Employees Occupational Illness Compensation Program (EEOICP) began on 31 July 2001. The program provides compensation and health benefits to Department of Energy nuclear weapons workers (employees, former employees, contractors and subcontractors) as well as compensation to certain survivors if the worker is already deceased. By 14 August 2010, the program had already identified 45,799 civilians who lost their health (including 18,942 who developed cancer) due to exposure to radiation and toxic substances while producing nuclear weapons for the United States. U.S. nuclear warhead stockpile, 1945–2002. A graph showing the amount of nuclear weapons stockpiled by either country during the nuclear race. The United States is one of the five recognized nuclear powers by the signatories of the Treaty on the Non-Proliferation of Nuclear Weapons (NPT). As of 2017, the US has an estimated 4,018 nuclear weapons in either deployment or storage. This figure compares to a peak of 31,225 total warheads in 1967 and 22,217 in 1989, and does not include "several thousand" warheads that have been retired and scheduled for dismantlement. The Pantex Plant near Amarillo, Texas, is the only location in the United States where weapons from the aging nuclear arsenal can be refurbished or dismantled. In 2009 and 2010, the administration of President Barack Obama declared policies that would invalidate the Bush-era policy for use of nuclear weapons and its motions to develop new ones. First, in a prominent 2009 speech, U.S. President Barack Obama outlined a goal of "a world without nuclear weapons". To that goal, U.S. President Barack Obama and Russian Prime Minister Dmitry Medvedev signed a new START treaty on April 8, 2010, to reduce the number of active nuclear weapons from 2,200 to 1,550. That same week Obama also revised U.S. policy on the use of nuclear weapons in a Nuclear Posture Review required of all presidents, declaring for the first time that the U.S. would not use nuclear weapons against nonnuclear, NPT-compliant states. The policy also renounces development of any new nuclear weapons. In the early 1980s, the revival of the nuclear arms race triggered large protests about nuclear weapons. On June 12, 1982, one million people demonstrated in New York City's Central Park against nuclear weapons and for an end to the cold war arms race. It was the largest anti-nuclear protest and the largest political demonstration in American history. International Day of Nuclear Disarmament protests were held on June 20, 1983 at 50 sites across the United States. There were many Nevada Desert Experience protests and peace camps at the Nevada Test Site during the 1980s and 1990s. There have also been protests by anti-nuclear groups at the Y-12 Nuclear Weapons Plant, the Idaho National Laboratory, Yucca Mountain nuclear waste repository proposal, the Hanford Site, the Nevada Test Site, Lawrence Livermore National Laboratory, and transportation of nuclear waste from the Los Alamos National Laboratory. On May 1, 2005, 40,000 anti-nuclear/anti-war protesters marched past the United Nations in New York, 60 years after the atomic bombings of Hiroshima and Nagasaki. This was the largest anti-nuclear rally in the U.S. for several decades. In May 2010, some 25,000 people, including members of peace organizations and 1945 atomic bomb survivors, marched from downtown New York to the United Nations headquarters, calling for the elimination of nuclear weapons. Some scientists and engineers have opposed nuclear weapons, including Paul M. Doty, Hermann Joseph Muller, Linus Pauling, Eugene Rabinowitch, M.V. Ramana and Frank N. von Hippel. In recent years, many elder statesmen have also advocated nuclear disarmament. Sam Nunn, William Perry, Henry Kissinger, and George Shultz—have called upon governments to embrace the vision of a world free of nuclear weapons, and in various op-ed columns have proposed an ambitious program of urgent steps to that end. The four have created the Nuclear Security Project to advance this agenda. Organizations such as Global Zero, an international non-partisan group of 300 world leaders dedicated to achieving nuclear disarmament, have also been established. The nuclear weapon delivery capability has been removed from B-1 heavy bombers. ^ According to Carey Sublette's Nuclear Weapon Archive, the United States "tested (by official count) 1054 nuclear tests" between 1945 and 1992. ^ "23 September 1992 – Last U.S. Nuclear Test". Testing Times. Preparatory Commission for the Comprehensive Nuclear-Test-Ban Treaty Organization. Retrieved 11 November 2017. ^ "Increasing Transparency in the U.S. Nuclear Weapons Stockpile" (PDF). Nuclear Posture Review (Fact Sheet). United States Department of Defense. 3 May 2010. ^ a b Kristensen, Hans M.; Norris, Robert S. (2018). "United States nuclear forces, 2018". Bulletin of the Atomic Scientists. 74 (2): 120–131. doi:10.1080/00963402.2018.1438219. ^ a b "Gallery of U.S. Nuclear Tests". The Nuclear Weapon Archive. 6 August 2001. ^ a b "Estimated Minimum Incurred Costs of U.S. Nuclear Weapons Programs, 1940–1996". Brookings Institution. Archived from the original on 2013-10-04. Retrieved 2013-08-18. ^ Paine, Christopher E.; Cochran, Thomas B.; Norris, Robert S. (4 January 1996). "The Arsenals of the Nuclear Weapons Powers: An Overview" (PDF). Natural Resources Defense Council. ^ a b Gross, Daniel A. (2016). "An Aging Army". Distillations. 2 (1): 26–36. Retrieved 22 March 2018. ^ a b c d e "50 Facts About U.S. Nuclear Weapons". Brookings Institution. 1998. Archived from the original on 2016-03-13. ^ a b Fact Sheet: Nuclear Weapons: Who Has What at a Glance, Arms Control Association (updated: July 2017). ^ a b Jungk 1958, p. 201. ^ "Bhagavad Gita As It Is, 11: The Universal Form, Text 12". A.C. Bhaktivedanta Swami Prabhupada. Retrieved July 19, 2013. ^ a b "J. Robert Oppenheimer on the Trinity test (1965)". Atomic Archive. Retrieved May 23, 2008. ^ "Chapter 11. The Universal Form, text 32". Bhagavad As It Is. Retrieved 24 October 2012. ^ "The Eternal Apprentice". Time. November 8, 1948. Retrieved March 6, 2011. ^ Hijiya 2000, pp. 123–124. ^ Hewlett, Richard G.; Anderson, Oscar E. (1962). The New World, 1939–1946 (PDF). University Park: Pennsylvania State University Press. p. 641. ISBN 978-0-520-07186-5. OCLC 637004643. Retrieved 26 March 2013. ^ Jones, Vincent (1985). Manhattan: The Army and the Atomic Bomb. Washington, D.C.: United States Army Center of Military History. p. 600. OCLC 10913875. ^ a b c Robert Lindley (2013). "Kate Brown: Nuclear "Plutopias" the Largest Welfare Program in American History". History News Network. ^ Daniel., Deudney (1983). Whole earth security : a geopolitics of peace. Washington, D.C., USA: Worldwatch Institute. p. 80. ISBN 978-0916468545. OCLC 9833320. ^ John Barry (2009-12-12). "Do We Still Need a Nuclear 'Triad'?". Newsweek. Retrieved 2010-10-08. ^ Office for the Deputy Assistant to the Secretary of Defense for Nuclear Matters. "Nuclear Stockpile". US Department of Defense. Archived from the original on 2010-05-10. Retrieved 2010-10-08. ^ "Toning Up the Nuclear Triad". Time. 1985-09-23. Retrieved 2010-10-08. ^ Norris, Robert S.; Kristensen, Hans M. (September–October 2007). "The U.S. stockpile, today and tomorrow" (pdf). Nuclear Notebook. Bulletin of the Atomic Scientists. 63 (5): 60–63. doi:10.2968/063005013. ^ Norris, Robert S.; Kristensen, Hans M. (March–April 2008). "U.S. nuclear forces, 2008" (pdf). Nuclear Notebook. Bulletin of the Atomic Scientists. 64 (1): 50–53, 58. doi:10.2968/064001012. ^ MacKenzie, Donald A. (1993). Inventing Accuracy: A Historical Sociology of Nuclear Missile Guidance. Cambridge, Massachusetts: MIT Press. pp. 343–344. ISBN 978-0-262-63147-1. ^ a b c Ron Rosenbaum (Feb 28, 2011). "An Unsung Hero of the Nuclear Age – Maj. Harold Hering and the forbidden question that cost him his career". Slate. Archived from the original on October 14, 2011. ^ a b "People and Events: The "Bravo" Test". Race for the Superbomb. American Experience. Public Broadcasting Service. 1999. Archived from the original on 2000-08-19. ^ Threat Assessment: U.S. Nuclear Plants Near Airports May Be at Risk of Airplane Attack Archived 2010-11-10 at the Wayback Machine, Global Security Newswire, June 11, 2003. ^ Newtan, Samuel Upton (2007). Nuclear War 1 and Other Major Nuclear Disasters of the 20th Century, AuthorHouse, p. 146. ^ Kennette Benedict (9 August 2012). "Civil disobedience". Bulletin of the Atomic Scientists. ^ Jay Davis. After A Nuclear 9/11 The Washington Post, March 25, 2008. ^ Brian Michael Jenkins. A Nuclear 9/11? CNN.com, September 11, 2008. ^ Orde Kittrie. Averting Catastrophe: Why the Nuclear Non-proliferation Treaty is Losing its Deterrence Capacity and How to Restore It Archived 2010-06-07 at the Wayback Machine May 22, 2007, p. 338. ^ Nicholas D. Kristof. A Nuclear 9/11 The New York Times, March 10, 2004. ^ "Legal Experts: Stuxnet Attack on Iran Was Illegal 'Act of Force'". Wired. 25 March 2013. ^ "Henry DeWolf Smyth Papers Collection Overview 1885–1987". American Philosophical Society. Archived from the original on 2008-05-11. Retrieved 2009-06-21. ^ "The Atomic Energy Commissions (AEC), 1947". Office of Science – Chicago Office. United States Department of Energy. Archived from the original on 2009-05-14. Retrieved 2009-06-21. ^ "The Energy Research and Development Administration (ERDA)". Office of Science – Chicago Office. United States Department of Energy. Archived from the original on 2009-05-14. Retrieved 2009-06-21. ^ "The Department of Energy (DOE)". Office of Science – Chicago Office. United States Department of Energy. Archived from the original on 2009-05-14. Retrieved 2009-06-21. ^ "United States Secretly Deployed Nuclear Bombs In 27 Countries and Territories During Cold War". National Security Archive (Press release). Natural Resources Defense Council. 20 October 1999. Retrieved 2006-08-06. ^ Larsen, Jeffrey Arthur; Smith, Dr. James M. (2005). Historical Dictionary of Arms Control and Disarmament. Scarecrow Press. p. 65. ISBN 9780810850606. ^ Chivers, CJ (2014-10-14). "The Secret Casualties of Iraq". The New York Times. New York Times Publishing Company. Retrieved 14 December 2014. ^ "President Bush: Libya Pledges to Dismantle WMD Programs" (Press release). National Archives and Records Administration. 19 December 2003. Retrieved 2009-06-21. ^ "Information Circulars" (PDF). iaea.org. Archived from the original (PDF) on 7 August 2007. ^ The ICJ (8 July 1996). "Legality of the threat or use of nuclear weapons". Retrieved 6 July 2011. ^ "United Nations Conference to Negotiate a Legally Binding Instrument to Prohibit Nuclear Weapons, Leading Towards their Total Elimination, 27 April to 22 May 2015". www.un.org. Retrieved 7 July 2017. ^ "Air Force Histories Released through Archive Lawsuit Show Cautious Presidents Overruling Air Force Plans for Early Use of Nuclear Weapons". Washington, D.C.: National Security Archive. April 30, 2008. Retrieved 2016-03-15. ^ "US Air Force planned nuclear strike on China over Taiwan: report". Agence France-Presse. 30 April 2008. Archived from the original on June 21, 2008. Retrieved 2009-06-21. ^ "Division of Energy Employees Occupational Illness Compensation (DEEOIC)". United States Department of Labor. ^ "Obama sets goal of world without nuclear weapons". The Independent. London. 3 April 2009. Retrieved 2009-06-21. ^ "U.S., Russia Agree To Pursue Nuclear Reduction". ^ Michael D. Shear (8 April 2010). "Obama, Medvedev sign treaty to reduce nuclear weapons". The Washington Post. Retrieved 9 April 2010. ^ David E. Sanger; Peter Baker (5 April 2010). "Obama Limits When U.S. Would Use Nuclear Arms". New York Times. Retrieved 8 April 2010. ^ Hans Kristensen (17 February 2011). "The Nuclear Weapons Modernization Budget". FAS Strategic Security Blog. Federation of American Scientists. Retrieved 23 February 2011. ^ a b Lawrence S. Wittner. "Disarmament movement lessons from yesteryear". 2009-07-27. Archived from the original on 2016-01-17. Bulletin of the Atomic Scientists, 27 July 2009. ^ Jonathan Schell. The Spirit of June 12 The Nation, July 2, 2007. ^ Harvey Klehr. Far Left of Center: The American Radical Left Today Transaction Publishers, 1988, p. 150. ^ 1,400 Anti-nuclear protesters arrested Miami Herald, June 21, 1983. ^ Robert Lindsey. 438 Protesters are Arrested at Nevada Nuclear Test Site New York Times, February 6, 1987. ^ 493 Arrested at Nevada Nuclear Test Site New York Times, April 20, 1992. ^ 22 Arrested in Nuclear Protest New York Times, August 10, 1989. ^ Hundreds Protest at Livermore Lab Archived 2013-01-17 at the Wayback Machine The TriValley Herald, August 11, 2003. ^ Lance Murdoch. Pictures: New York MayDay anti-nuke/war march, IndyMedia, 2 May 2005. ^ "Anti-Nuke Protests in New York", Fox News, May 2, 2005. ^ A-bomb survivors join 25,000-strong anti-nuclear march through New York Archived 2013-05-12 at the Wayback Machine Mainichi Daily News, May 4, 2010. Woolf, Amy F. U.S. Strategic Nuclear Forces: Background, Developments, and Issues. Washington, D.C.: Congressional Research Service, August 8, 2017. "Presidency in the Nuclear Age", conference and forum at the JFK Library, Boston, October 12, 2009. Four panels: "The Race to Build the Bomb and the Decision to Use It", "Cuban Missile Crisis and the First Nuclear Test Ban Treaty", "The Cold War and the Nuclear Arms Race", and "Nuclear Weapons, Terrorism, and the Presidency".